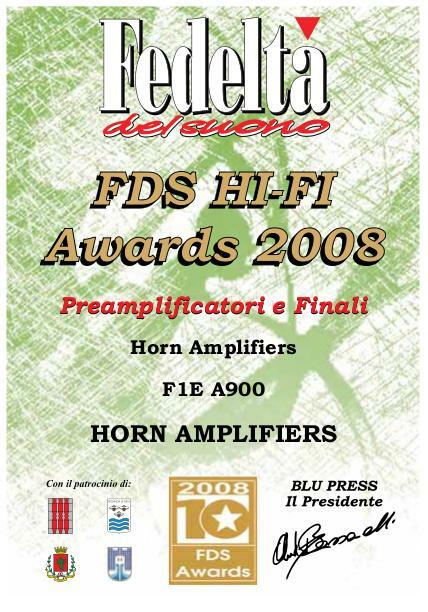 A900 is a dual mono Pure Class A amplifier in Pure Class A. The design philosophy is fully HORN, as regards the conception of the power electronics used for the audio playback. The concept "No masked sound", which already features the 'Sinfonico' line amplifiers, was placed in the design phase as the only constraint. Thanks to this rigid imposition and adoption of solutions without any compromise we are witnessing an evolution of the predecessors of A900, giving this machine the features just to give you hours of listening pleasure. to learn more about. " the A900 is fast, EXTREMELY dynamic and. delighted by the high frequencies and a perfect rhythm, I can say I achieved the state of grace, the illusion of the live event. " The circuit solutions used give warmth to the sound, speed and detail. The MOSFET output stage was designed and optimized to show no hesitation in front of the most difficult interfaces, transferring the power to the speakers from the large reservoir of energy made ​​available from the power supply. Aesthetically essential (settled concept for HORN), presents construction details that give it great strength and reliability. A900 comes in two power ratings: 40W +40 We 68W +68 W. Input vesions: unbalanced (A900), balanced (A900EM).